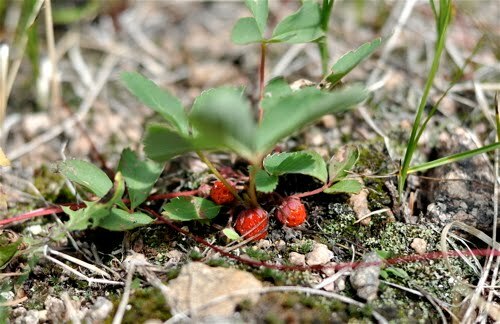 While hunting porcini the other day in the Colorado Rockies we stumbled on a large patch of wild strawberries (Fragraria sp.). Score! It seems I never find wild strawberries back home before the animals get to them, but for whatever reason we hit the jackpot on this less familiar ground. The strawberry is one of those edible plants little improved by domestication. Sure, garden varieties are more prolific, with bigger berries, but their taste seldom rivals the complex strawberry flavor of their wild progenitors. 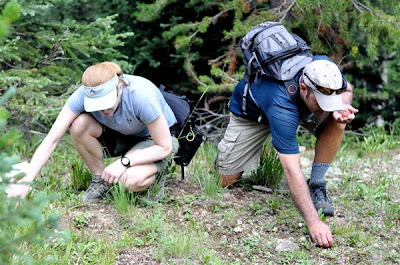 In fact, the native strawberry patch is a perfect place for a wild food skeptic to have a Demascan Road moment—the small red, intensely flavorful berries are an object lesson in the providence of nature and testament to the fact that our tinkering is not always an improvement. My friends, who were along for the mushroom hike, had never eaten wild strawberries before and were quite simply blown away that something this delicious could be growing so inconspicuously on the forest floor. 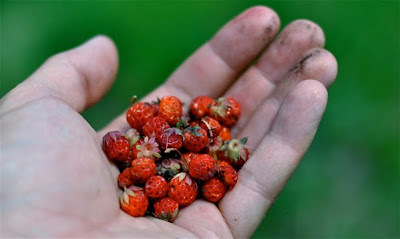 Wild strawberries are found through much of the temperate world and across most of North America. Look for them in clearings, forest margins, and along roadsides and trails. Though frequently found in shady woods, they need ample sunlight to fruit. Woodland critters crave them as much as we do and my experience has been that the biggest obstacle to eating a handful of wild strawberries is not in locating the plants but in returning at just the right time to pluck ripe berries before the squirrels and rabbits and box turtles finish them off. If your timing is good, you'll find the next difficulty is living beyond the moment and putting a few aside for later to top pancakes and so on. The hand-to-mouth impulse proved too strong for us. There would be no conveying any berries home. Instead we happily sat in the dirt and gathered handfuls to eat as fast as we could pick. A neighbour gave us some about eight years ago and each summer they pop up in various places around the garden. The fruit never makes it indoors - I eat it as I garden. The tiny berries are deliciously tangy, juicy and refreshing, especially on a warm day. In my opinion, the Queen of wild forage is the wild strawberry, both the ground variety and the "bell" variety that grows up on a stem with the fruit hanging down like a bell. I once tried to bag them and bring them out with a bunch of huckleberries, and they didn't keep well. They seemed to almost melt by the time we were back to the house. Ever since... I eat them on the spot when and where I find them.